In 1974 Charles W. Colson pleaded guilty to Watergate-related offenses and, after a tumultuous investigation, served seven months in prison. 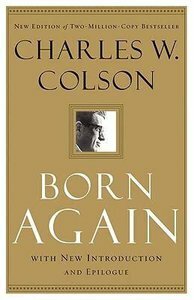 In his search for meaning and purpose in the face of the Watergate scandal, Colson penned Born Again. This unforgettable memoir shows a man who, seeking fulfillment in success and power, found it, paradoxically, in national disgrace and prison. In more than three decades since its initial publication, Born Again has brought hope and encouragement to millions. This remarkable story of new life continues to influence lives around the world. This expanded edition includes a brand-new introduction and a new epilogue by Colson, recounting the writing of his bestselling book and detailing some of the ways his background and ministry have brought hope and encouragement to so many. Customer Reviews For "Born Again (Repackaged)"
Born Again by Charles Colson is an old book but it's well-written.It's readable and the thought flows smoothly through revealing a man's heart that was torn by the political struggles in his time. He was a brilliant lawyer faithfully serving the US President Nixon until the Watergate crisis arose with serious repercussions on him and his family and on others too. However, before it happened he met Tom Phillips who witnessed to him about his faith in Christ and gave him C.S.Lewis' book, Mere Christianity. That started Colson on his spiritual journey with Christ. His honest disclosure of his discovery of the reality of God is touching and inspiring. I think everyone should read the book to see how Christ made a difference in a world of chaos and is very relevant to us today. Imprisoned for admitting his 'guilt' to save others implicated in Watergate, Colson learnt how real God was to him there among some hardened criminals. Colson's witness, beginning with a small prayer group, led to the change in many lives for good. We also see God's plan to keep him there after some of his friends were pardoned and released. God used him to help others come to acknowledge Him as Lord and Saviour and then Colson was released. I couldn't put the book down after starting to read so I encourage every reader to go and get a copy and enjoy it. I absolutely love Charles Colson books. Born Again traces the developments in Colson's life that eventuated in his conversion to Christianity. Prior to being a Christian, Colson was special council to Richard Nixon. He was jailed for involvement in Watergate. Prior to his sentence he converted, though no body believed Nixon's former hatchet man as it seemed a scheme to gain favor with the judge. The second half of the book traces the growth of his prison fellowship ministry and its many achievements. This is a hugely inspiring read and I'd recommend it to anyone.